On Llewelyn’s return the truant, stained and smeared with blood, joyfully sprang to meet his master. The prince alarmed hastened to find his son, and saw the infant’s cot empty, the bedclothes and floor covered with blood. The frantic father plunged his sword into the hound’s side, thinking it had killed his heir. The dog’s dying yell was answered by a child’s cry. Llewelyn searched and discovered his boy unharmed, but nearby lay the body of a mighty wolf which Gelert had slain. The prince filled with remorse is said never to have smiled again. 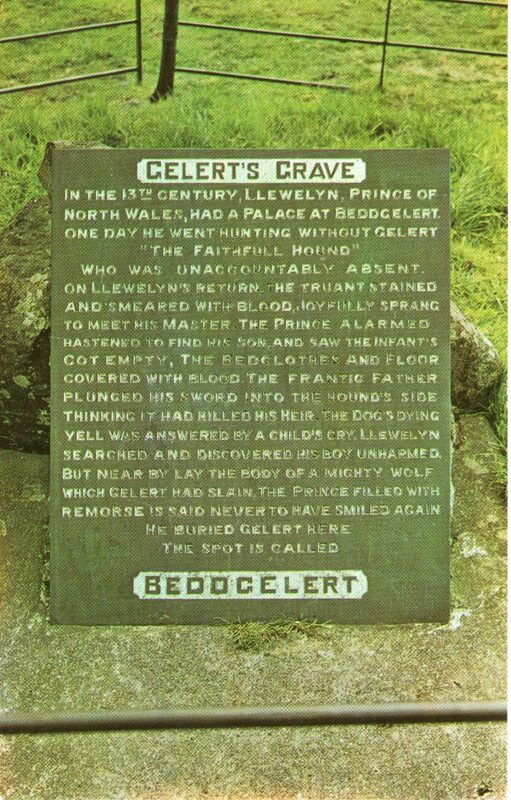 He buried Gelert here. The spot is called Beddgelert.